'Stepback' is the killer track in this double pack to my ears. A great cut that builds in suspense, with the vocal fading in and out over some sinister chords and spitting percussion. 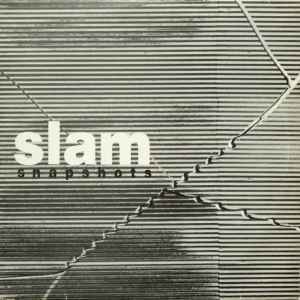 As one of Slam's earlier releases, you can hear the influence of early techno in SNAPSHOTS: an unrelenting beat, a deep chord hit, and a simple, filtered word repeated over and over again on "Stepback." But "Groovelock" has more of a melody, combining with the bassline for a more Detroitian journey. "Spirit" stays more upbeat too, but "Stepback 2" returns to the minimal beats. "Program" spins in place perhaps too long, but it's nice as a darker-tinged floor holder, but "Car Thief" provides that plus a little more development via car alarm. While good all-around, it's "Groovelock" that really makes this worth it. I first heard this 8 years ago when I was 16, when I bought it on vinyl not knowing anything about it other than these were the "Positive Education" guys. I could still not like this release more. 6 long tracks of deep tech-house better than most I had heard before hearing this and than most I've heard after. It's worth it alone for "Stepback" and "Program", some of the deepest techno you'll ever hear. Side A. Slam's hypnotic and repetitive order to "Stepback" is one of the most energy charged tracks you can spin. A techno bomb with threatening, roaring sounds and such a massive impelling ride that you better take cover....This is definitely one of my favourite tunes ever. By the way,the 2002 Smith & Selway remix could not reach a quarter of this level. "Groovelock" certainly one of the finest late night / back-to-mine tracks of its day; simple and long (or relentless, depending on your state of mind) - but always beautiful. Also featured is the excellent pump and grind techno of "Program".